Best Pizza Ever! Here is the truth >> every year, year in and year out, we order Lou Malnati’s pizza to serve at our annual Super Bowl party, often on Father’s Day, and occasionally for birthday celebrations for brothers and sisters and nieces and nephews across the country. Everyone in the family looks so forward to the square box that arrives at their doorsteps, firmly packed in styrofoam and dry ice to keep the pizzas’ properly frozen. 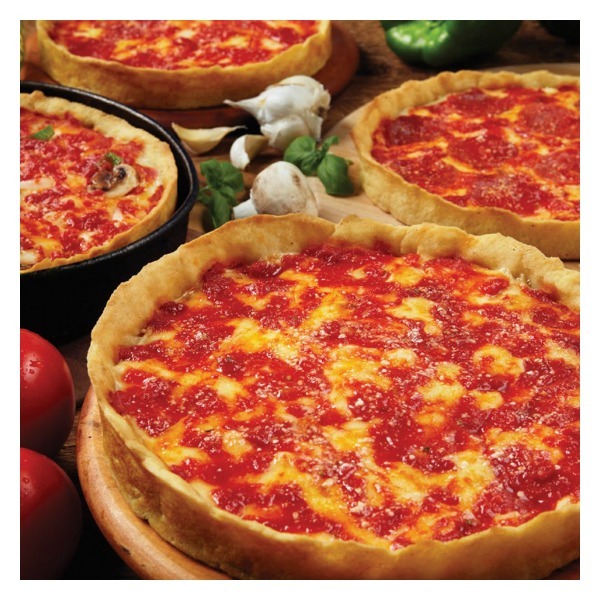 Lou Malnati’s pizzas are made according to the family’s original five-decade-old deep dish pizza recipe. All pizzas are hand-made from scratch, baked and quickly frozen to preserve their hot out of the oven freshness. Each pizza is 9″ and serves 2 adults. Be sure to follow the cooking instructions to the letter including wiping the pizza tin dry before baking. Remember these are not your corner pizzeria pizzas. They are deep dish pizzas and if you order the sausage pizza you get a layer of sausage not little balls or sprinkles of sausage. If you have never tasted Lou Malnati’s Deep Dish Pizza you are in for treat. It is worth every penny!